Next to the Roadrunner the most unthought of Warner Bros Character, but he is my favorite. Besides, if you don't know who he is you better learn - we're blocking his view of Venus! 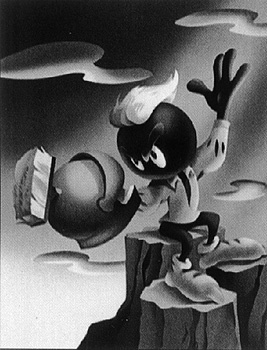 Marvin first arrived on the screen July 24,1948 in a screening with Bugs Bunny -"HareDevil Hare" where Bugs inadvertantly discovers Marvins attempt to blow up the Earth with a "Uranium"* Pew-36 Explosive Space Modulator. Note that due to goverment sensors and a rumour that the Soviets thought we had a new source of Atomic Fuel - the name was modified to the Illudium Pew-36 in later films. While he only featured in 9 shows (10 if you count Space Jam), he has made guest appearances with many Warner Bros characters. 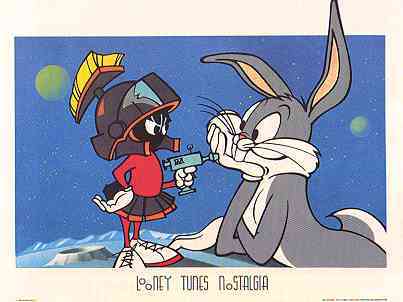 Simply Drawn, creator Chuck Jones wanted to create a villian for Bugs to battle that was neither bigger or louder than Americas favorite Rabbit. This explains Marvins rather quiet disposition and how it catches Bugs off Guard so often. Marvin simply wants to have a good view of Venus and the Earth just gets in the way - nothing personal you see! As his Big Screen and Televison Career faded, Marvin spent a couple years working in the Off Off Broadway Theater circles, here we see him in the role of Hamlet. Almost typecast to play this role for the scene with Yurick, Marvin missed his call as a Stage Actor. Actors Equity found out and Marvin almost lost his Union Card, rumor has it that Wiley Coyote lent him a considerable amount of cash to clear his legal fees and retain his Union rights! Bugs was quick to offer legal counsel but Marvin chose rather to be represented by Foghorn Leghorn - a more distinguished Southern Lawyer! 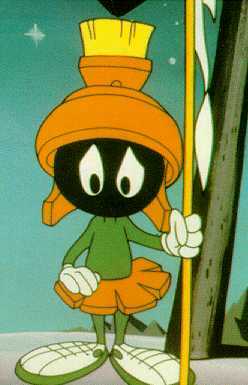 In the above Cel, we see Marvin on Terra Firma planet earth for the first time. No he is not portraying a CMU Parking Bureau Employee, although he is assuming somewhat correctly that a machine is a minion to the human race. Marvin is quickly introduced to his old arch-enemy, Bugs Bunny and the race to save the planet is on! 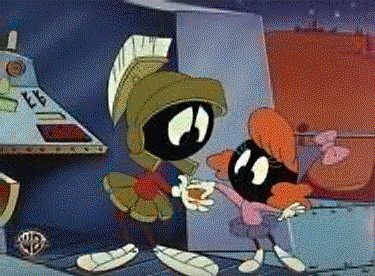 In another rare cel, we see the cause for Bug's continued failure on the Red Planet Marvin calls home - Instant Martians. Now granted they aren't as evolved as Marvin, after all they are in Concentrated Form (just add water) but they are a loyal and dedicated army - smart as Lemmings but dedicated. Marvin in current life is off fighting for more important things than just a good view of Venus! He we see that he has been enlisted in the Fight against Useless Violence. 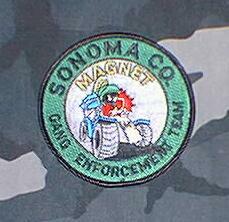 The Sonoma County (california) Sheriffs Department has asked Marvin to help them with the task of cleaning up crime in the Gang Violence Enforcement Team. Oh if it were only as simple as that - how long would the average Gangbanger (delusional idiot) last against an ACME Disentigrator Gun wielding alien???? They neither have the class or the inner fortatude to present a challenge like Bugs did all these years - Lemmings to the slaughter I say! 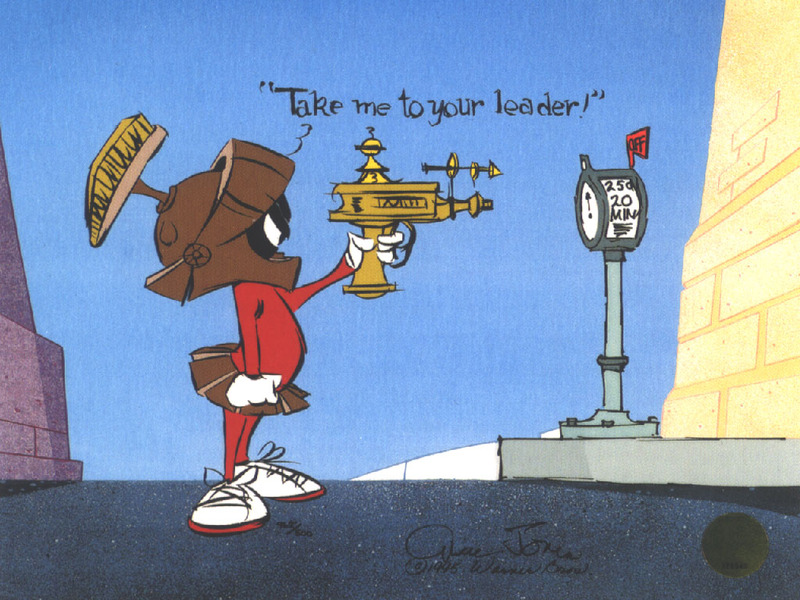 As you see Marvin has evolved from the start, Above is the original sketch that Mr. Jones started with. 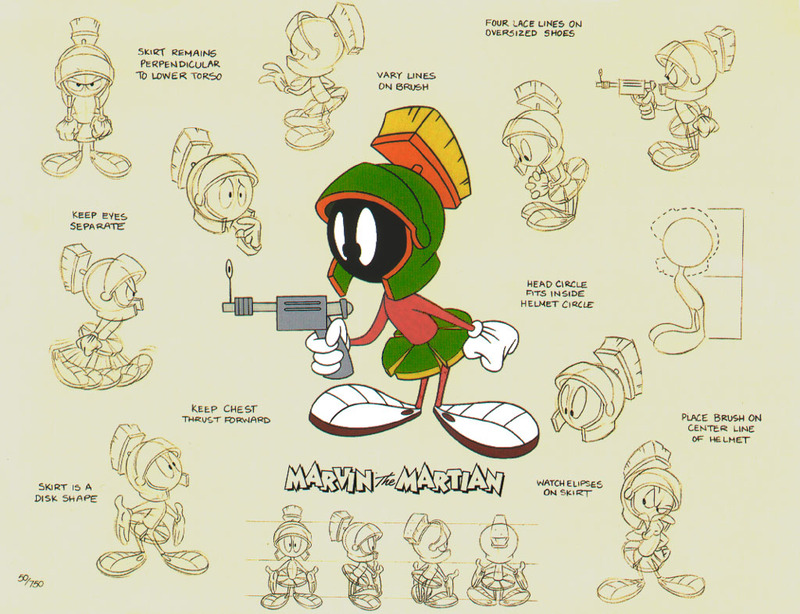 Below is a early version of what Marvin looked like. You will notice that the coloring we are all used to isn't what he started out as. This rare picture is the only one known showing other Martians with Marvins "form". This is Marcia, she is Marvins little cousin who had a brief debut on one of the early episodes. This picture, along with others, came from many of the devoted "Marvin Fans" across the web. While many may not know about our little martian friend, some of us will never forget him! 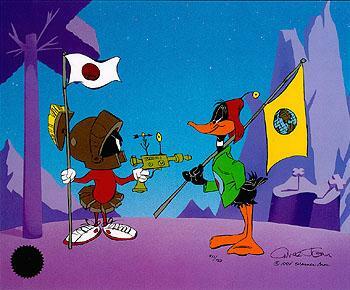 Bugs Bunny wasn't the only character to duel with the martian over the years. Daffy Duck as "Duck Rogers" had his fair share of encounters too! With Daffy's excitable nature it was a match made in heaven and Marvin got his goat easially each time. 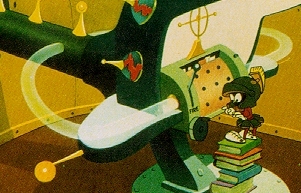 Add in Marvins ACME Brand Disintegrator gun and you know that Daffy had a tough time keeping his act in one place (note: to the best of my knowledge - Bugs only lost a bit of his tail to Marvins Aim). There where two episodes of "Duck Rogers in the 24th and a Half Century" but if you where to ask Daffy - I am sure that was more than enough! 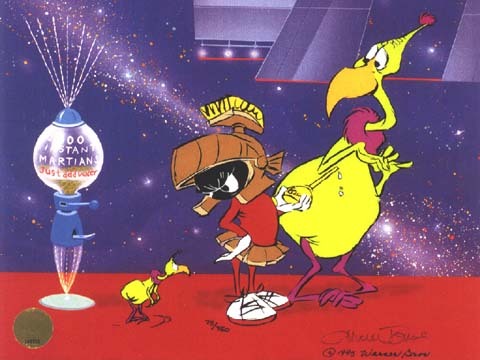 Marvin at the controls of his Explosive Space Modulator Cannon attempting another shot at Earth, Hmmm where's Bugs - must be off stealing the Illudium Pew-36 fuse for the cannon. Earth is safe again, at least until next week! Of course we can't forget Marvin's loyal companion: K-9! K-9 accompanies him in most of the features and plays the goofy but loyal assistant that every world dominator needs. Bush had Quayle, Foghorn had Junior, and Marvin had K-9. One spectation on the lack of his appearance in Marvin features is that K-9's agent was constantly trying to get his client a bit more respect and maybe even a voice which caused serious production delays. In the end K-9 realized that despite his dreams and ambitions he was basically just a Martian Dog and that he was at the height of his career. On a side note - it is rumoured that K-9 had a lengthy affair with the Warner Bros Sister "Dot" that almost led to Marriage until she realized that she could never break his bad habits (licking in public, drinking out of toilets, and crotch sniffing). Once a dog -always a dog, no matter what planet you're from. How I wonder what your worth. Heads are big, but brains are small. Ray gun beams from town to town. Twinkle, Twinkle, do it fast! Thirty Seconds left to last. Ray guns ready, no more quirks! Now I'll wait and hope it works. Twenty seconds left to last. 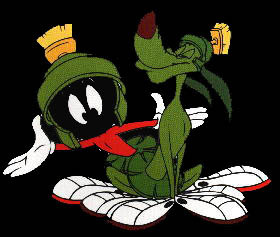 Click the image below and Marvin will Zap you off to the Offical Warner Brothers "Marvin the Martian" Site.